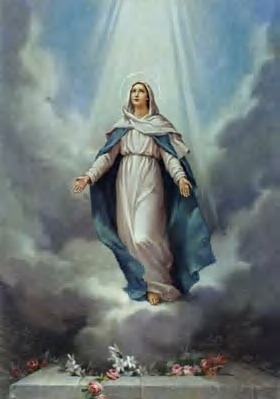 Lastly, tomorrow is the Feast of the Assumption of Mary. The Assumption is a Dogma of the Faith. Thus we as Catholics are required to believe the miracle that because of our Blessed Mother’s holiness, virginity and sinlessness, God did not allow death (the just punishment for sin) to enter her body. It is a Holy Day of Obligation, or as some like to call it: a day of opportunity! So, go to Mass! Give thanks to God for the work he has done in your life and ask his Blessed Mother to watch over you. And while there say an Ave for me! Thanks Grams! Love you too!